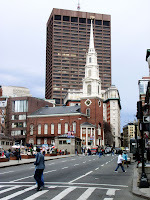 Park Street Church, viewed from Tremont Street. Built in 1809, its 217 ft. steeple, once one of the tallest in the city, is now dwarfed by taller buildings in the area. The church is known for its many firsts: On July 4, 1829, William Lloyd Garrison gave his first public anti-slavery speech here and two years later, "My Country 'Tis of Thee" was sung for the first time by the church children's choir. The church is still a vibrant and active presence in the city; visit the church's website.